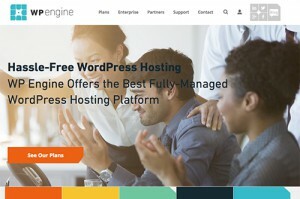 WPEngine is the fastest and most reliable of the Managed WordPress hosts we tested. They are about 30% more expensive than other options, but if you are looking for the best of the best. WPEngine is who you should go with. They are also running a killer deal with their coupon. WordPress is a killer content management system that makes publishing content to the web super easy. Although WordPress out of the box is pretty easy to work with, you will most likely need to tune it to work well for any serious website. Managed WordPress hosting takes care of a lot of this tuning for you. Specific features for managed WordPress hosting vary from host to host, but you can expect improvement in speed, security, scalability, and support across all of the hosts. Managed WordPress hosting does many things to make improvements on all of the above. Managed WordPress hosting will increase the speed of your websites primarily by caching everything automatically, and by serving all of your static content through a CDN. The caching will decrease or eliminate the amount of time it takes to generate a page and the CDN will help serve static content faster by serving it from servers closest to your visitors. Something else you can expect from switching to managed WordPress hosting is better security. Managed WordPress hosts primarily achieve by automatically backing up your site and doing automatic upgrades on the WordPress core, security updates, and plugins. Managed WordPress hosts increase scalability again by caching everything, running a MySQL cluster, using CDN’s (only WP Engine provides a CDN included in your plan), using great hardware, and many other things. The point is, Managed WordPress hosting providers are the best at what they do, and that is making WordPress super fast, scalable, and secure. One last, but very important, feature of managed WordPress hosting is customer support. You will be paying a premium price for managed WordPress hosting, and with this you’re not only going to get a rock-solid WordPress website, but you should also get world class service. Since using WP Engine for my managed WordPress hosting provider, I have contacted them for some WordPress related questions and I have always received responses very promptly (usually within 30 minutes to an hour). Also, WP Engine stands out again as a managed WordPress hosting provider because they go to many, if not all, of the WordCamps! These guys are not only knowledgable, but also involved in the WordPress community, which makes them world class in my book. If you have any other questions about managed WordPress hosting please leave a comment below and I will promptly reply!